Machismo has always been a big part of the Panerai narrative. The notion that collectors of the brand exude certain archetypically male characteristics of strength, creativity and daring isn’t exactly a new one; and is most famously embodied in the personage of longtime collaborators like Mike Horn. That’s still certainly the case in 2019, as journalists discovered during SIHH. Beyond a range of new novelties in the burgeoning Submersible line — an offshoot of the ever-popular Luminor — the brand celebrated its newest ambassador, Guillaume Néry, with an eponymous special edition of the Panerai Submersible Chrono. 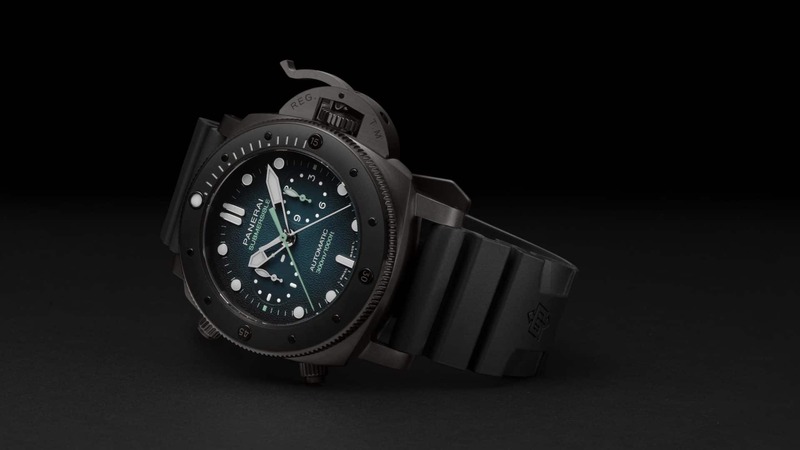 The retired French free-diver (best known for setting four world records between 2004-2008 for deepest dive without breathing apparatus) is an individual very much in the mould of previous Panerai spokesmen; swapping out the challenges of Arctic circumnavigation for the perils of unassisted deep sea diving. In other words, his namesake novelty — a divewatch/chronograph hybrid — does an effective job of extending Panerai’s reputation for bundling tool watches together with an extremely challenging experience. 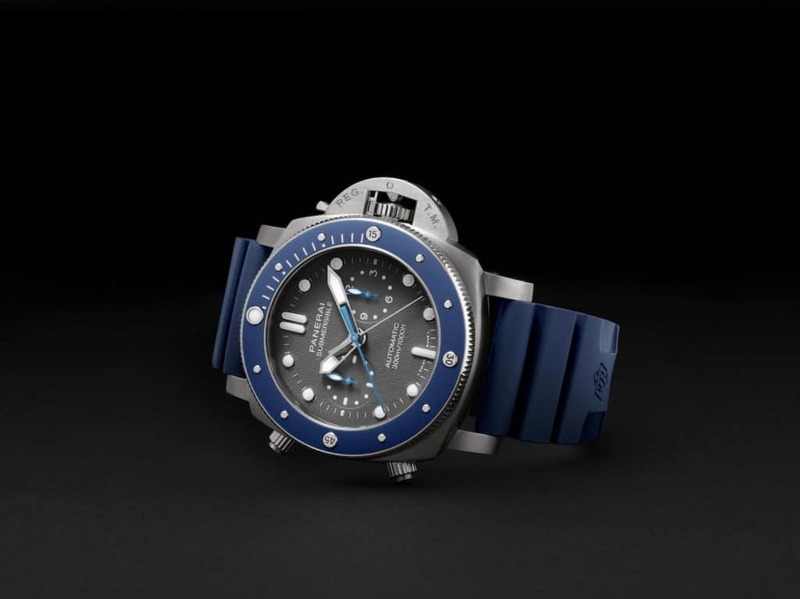 For SIHH 2019, Panerai actually released two versions of the new Guillaume Néry inspired Submersible Chrono. The first of these (pictured) is a HK$147,000 titanium diver, limited to a production run of 500 pieces worldwide. It’s important to note that the Gulliame Néry Submersible actually comes in two versions: the first of these, per Panerai naming convention, is the PAM00982 — a 47mm diver that’s encased in titanium and equipped with a column wheel chronograph. Save for a couple of material variances (e.g. the “sharkskin” grey dial and a ceramic insert bezel), it’s functionally identical to the consecutively numbered PAM00983. Both are powered by the calibre P9100 — an in-house movement built and designed at Panerai’s Neuchâtel manufacture — and feature design elements inherited from the Luminor. This then begs the question: why is the PAM00983 double the price of its blue and grey counterpart? In a nutshell, because it comes with the promise of adventure. What the PAM00983’s HK$298,000 price tag will get you: a blacked out DLC case, blue/black gradient dial, and the opportunity to go diving with Guillaume Néry in French Polynesia. Limited to an allocation of 15 pieces worldwide, the price tag of the PAM00983 combines Panerai’s newest Submersible novelty with a trip to Mo’orea. Aside from its popularity as a honeymoon and marine wildlife destination, the French Polynesian island is home base for Néry — the jumping-off point from which 15 collectors will be able to whale watch and submerge under the tutelage of the two-time world champion. Whether that’s enough to justify the significant price hike (as compared to the PAM0092) largely depends on your priorities, but the PAM00983 does demonstrate a few aesthetic details which aren’t available in the more mainstream Submersible Chrono. The most obvious of these are the blacked out DLC case, which gives the watch a more tactical and streamlined on-wrist appearance (especially when luminescent); and a fume dial that alternates between black and turquoise blue. Given the inclusion of the Luminor crown protector – arguably one of Panerai’s most distinctive design elements – both the PAM00982 and PAM00983 have their chronograph pushers located at 8 and 10 o’clock. This makes the Submersible Chrono especially user-friendly for those who wear conventional watches left handed. By combining the most distinctive design elements of the Luminor with the performance of the Submersible range, Panerai have created a dive watch that is ideal for professional usage. The Submersible Chrono is waterproof to a depth of 300m (for reference, the minimum depth rating required under ISO 6425 is 100m) and, in either edition, is outfitted with a grippy knurled bezel which can be actuated through thick gloves. 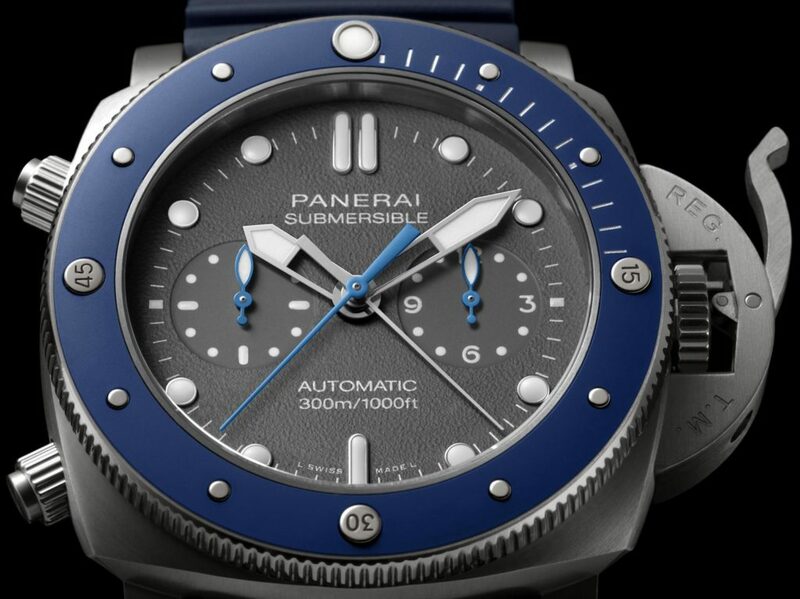 Given the history of Panerais as military instruments, it’s unsurprising that visibility plays a key role in this Submersible — the dial’s oversized lume plots are clearly legible even hundreds of metres below sea level. The layout for the chronograph is similarly functional: two registers encompassing running seconds and a 12-hour totaliser are located at 9 and 3 o’clock; while elapsed minutes are calculated using the bezel. At 47mm, it’s hardly a compact watch but the cushion case and curved lugs help to make the overall wearing experience comfortable (the proportions make even more sense when you consider the Submersible is meant to be worn over a divesuit). Like most function-first dive watches, the Submersible Chrono features a sealed caseback that hides the calibre P9100 from view. That doesn’t detract significantly from the sportif aesthetic, as the movement itself features relatively little decoration (save for chatons and the balance wheel). 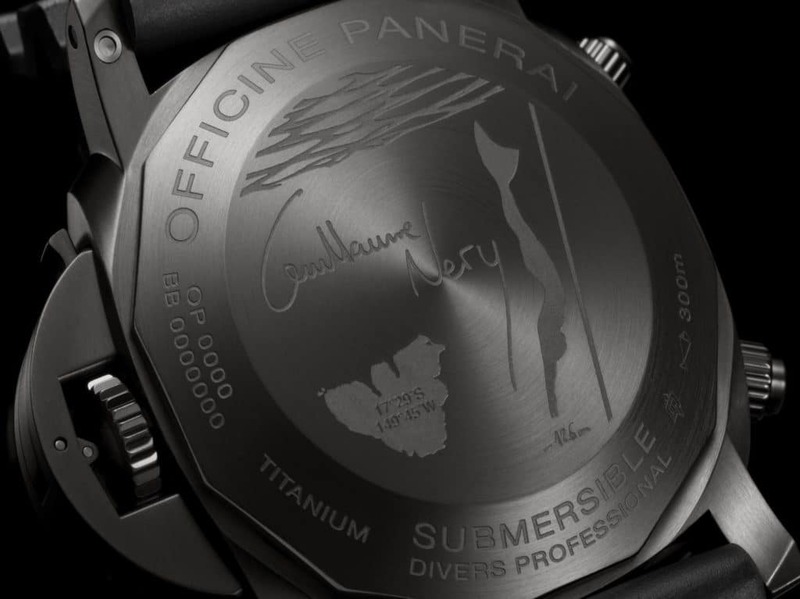 Instead, the caseback is decorated with a few engravings, principal amongst which are Néry’s signature, a relief of Mo’orea (including the island’s geographic coordinates) and “126m” — a reference to his record setting free dive in 2015. 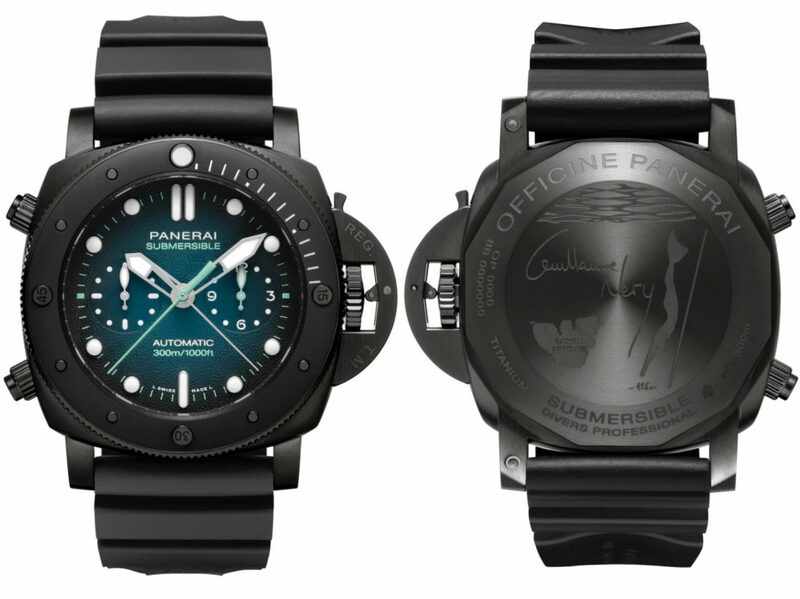 The Panerai Submersible Chrono Gulliaume Néry Edition is available in titanium (HK$147,000) or DLC coating (HK$298,000). To learn more, visit Panerai online.